These technologies are great if your environment support them end to end, but if not you may see some of the following issues. 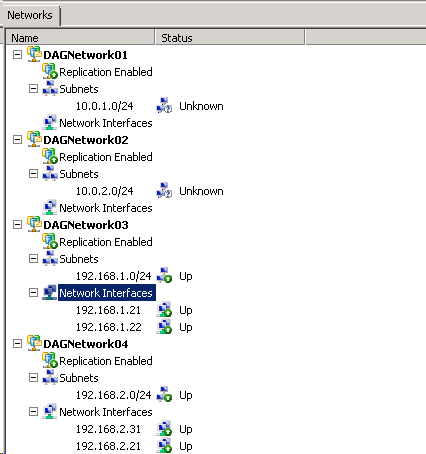 When you add servers to a DAG it will create a network for every subnet\NIC that server is connected to, this is nice because as soon as you add the server it can replicate with the other nodes. 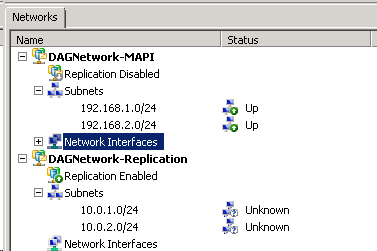 However there are some post configuration steps you need to take otherwise replication will occur over the MAPI\Client network and never use the replication network. You should NEVER have multiple gateways, if you have a private\heartbeat network that is routed you need to remove the gateway and add a static route. The issue with this configuration is that there is no clearly defined replication or mapi networks, so what we need to do is collapse them into 2 dag networks. Modify the networks to include both subnets, (I named mine for easy identification. I would also recommend disabling replication on the MAPI or client network, (it will be used anyway if the replication network is not available.